This is the French paperback edition of The First Eagle, the thirteenth Tony Hillerman Navajo Mystery novel featuring Joe Leaphorn and Jim Chee of the Navajo Tribal Police. 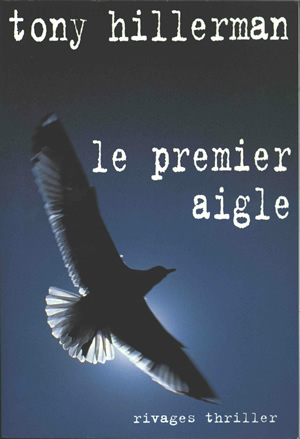 Published in 2000 by Éditions Payot & Rivages in Paris, France, the text was translated into French by Danièle and Pierre Bondil. The cover photo, credited to Photonica, features a photograph of a backlit large web-footed bird, wings spread, against a blue sky shading to dark navy at the top of the cover. The author's name, book title, and "rivages thriller" are printed in white in a typewriter-style font. The back cover is black and contains the book title, translation credit, synopsis, publisher's imprint, bar code, and price printed in white. The spine is also black and the author's name, book title, and "RIVAGES/THRILLER" are printed on it in white. A red band is attached to the book and secured by flaps. On the front of the band, printed in white, is a quote from the Denver Post. On the back of the band, the publisher and price information from the back cover are repeated. On the spine section of the band is printed "RIVAGES/THRILLER" in white. Binding: Paper covers with full color photograph. The author's name, title, and publisher are printed on the spine.